Derek Bailey, electric guitar; Han Bennink, drums. 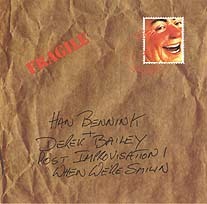 In early 1999, Derek Bailey and Han Bennink discussed over the phone the idea of exchanging practice tapes for each other to play with. Out of this arose two CDs, this and Incus CD 35. On this CD, Han's pieces were recorded first - at the BIMhuis - and sent to Derek, who recorded electric guitar at Moat Studio, around June 1999. The follow up CD worked in the opposite direction. Cover design (reproduced above) by Karen Brookman.